Despite their potential protesting, kids like a schedule. It helps them stay on target. For the homework zone, you can schedule their time after they’ve come home and had a snack and before dinner. Some kids would prefer waiting until after dinner. Either way it needs to be set in stone. Kids need to go “off the grid” when they’re in the homework zone. That means no TV, no phone and no music. Everything should be shut down. This probably isn’t a problem for the young ones but when you get into the teenage years, prying that cell phone out of their hands will be a challenge. That’s what you should set these rules early. Every parent wants to help their kids especially if they see them struggling with a problem. Helping with homework doesn’t mean doing homework. You can guide them towards an answer but if you ever pick up the pencil you’re not doing them any favors. Every piece of homework should get a grade and if your kid returns with high marks, then that should be celebrated. Those assignments should go up on the fridge. After that, they should go into a file. Yes, keep everything. They’ll appreciate that years from now. It also helps to set up a clutter free space for the homework zone. This can be a dedicated desk in a corner of a downstairs room. The older the kid, the more likely they’ll want to do their homework in their rooms but you have to watch out for those distractions. The zone should be a well-lit place with all the supplies they would need in handy ready. If you need to clear out some furniture to make room for the desk, then you’ll want to being in the junk movers from Junk Works. This is the crew that can quickly clear out any space of any unwanted items. Keeping your home free of clutter can hopefully inspire your child to do the same with their room. Use that Junk Works session to get the unwanted things from their closets and room, too. 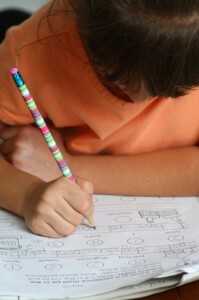 Let Junk Works help you set up the homework zone in your home and watch the good grades start rolling in. This entry was posted in Cleaning Tips and tagged homework zone, junk works on July 31, 2018 by Junk King. Last updated August 2, 2018 .